Celebrate in the cycle of seasonal beginnings and endings. 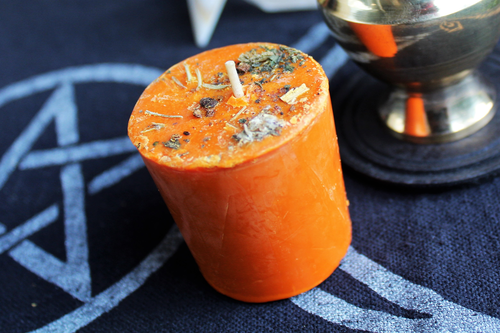 This hand-made soy candle by Modern Magix can be used during any of your Samhain traditions. Incorporate this on any altar or personal space to encourage communication through the veil and to honor loved ones who have passed. The rich scent of seasonal pumpkin, clove, and allspice will whisk you away into a land of autumn beauty. Hand-poured soy wax. Scented with pumpkin spice fragrance oil. Herb blend includes the following: rosemary, nettle, clove, allspice, mugwort*. **Note: People who are pregnant should avoid coming into contact with mugwort. 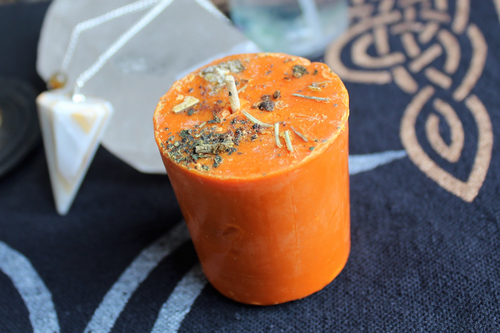 Please send us an email if you would like to request candles made without mugwort.